by the US Government and the complicity of the corporate media. that the 9/11 Commission Report is incomplete and further research is needed. media did not bother to attend. government’s lies and mainstream media complicity. Latham-Ponneck, Sonoma County Peace and Justice Center board member at DC rally. complicity in the attacks of 9/11 and the invasions of Afghanistan and Iraq. Robin Lathan-Ponneck described her motivation for attending the convergence. government let it happen and the government made it happen. networked, received affirmation, and heard speakers and workshop presenters. over meals and after hours in the dorms were eye opening in a sad and heavy way. 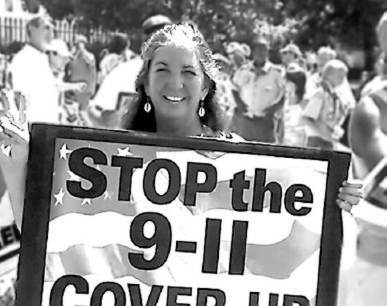 Robin Lathen-Ponneck stated, “The bad news is: it looks like an inside job.